Newly revised, this guide is designed for students seeking top GMAT scores. It offers essential techniques for approaching the GMAT’s most difficult math problems, along with extensive practice on challenging problems, of which over 20% are brand new. Tackle the GMAT’s toughest quant problems with the world’s leading GMAT Prep company. To get into top business programs, you need top GMAT scores, and GMAT Advanced Quant is designed to get you there. Written for students striving for 800, this book focuses on building your high-level quantitative skills by combining elite techniques for problem solving and data sufficiency with intense practice. Learn the tactics most often used by top-scorers and train your instincts as you work through over 250 of the toughest practice problems, then test your skills online with access to two additional online practice sets! 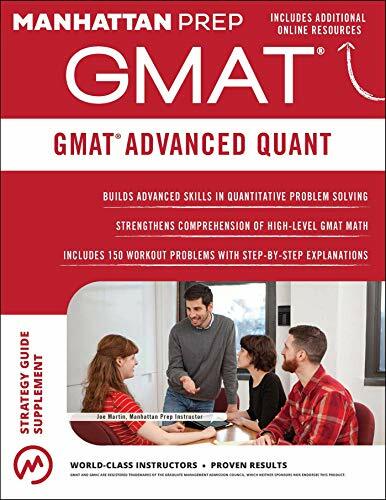 Written by Manhattan Prep’s 99th percentile GMAT instructors, GMAT Advanced Quant will help you get over that last hurdle on your path to 800.